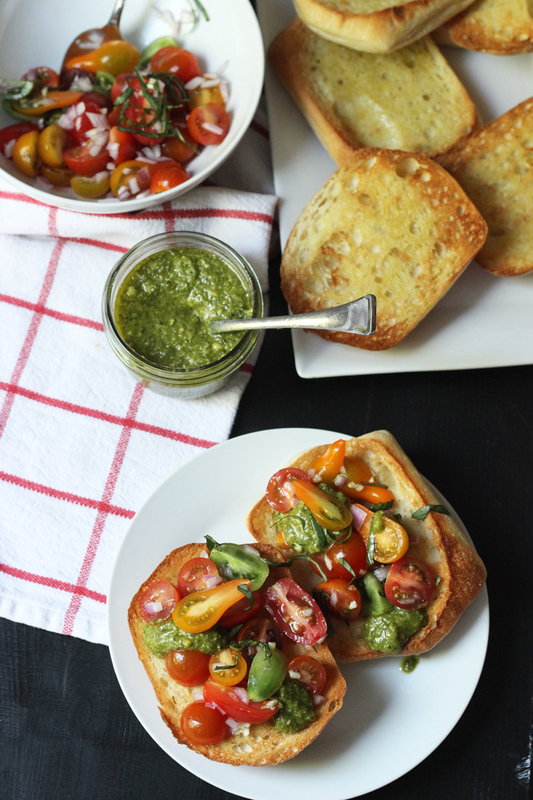 Enjoy all the bright flavors of summer in this easy-to-prep Pesto Bruschetta. An ideal appetizer, it also makes a great light lunch. We spent late spring/early summer traipsing through Great Britain. We had a really nice time. It seems that I rarely take time off unless we go overseas. I’m thinking that we need to go overseas more often! While I save the money to do just that, I’m enjoying some great tastes that we encountered during our time in England, Scotland, and Wales. One restaurant that we frequented quite often was Zizzi, a favorite stop from our previous trip to London. It’s a UK chain that specializes in Italian food. Thanks to a strong dollar and offers (aka coupons) I downloaded from their website, we were able to enjoy Zizzi almost twice a week. Some of the kids got really adventurous in their meal selections, while others chose the same “Margarita Pizza add pepperoni” every single time. For my part, I tried something new almost every meal. Isle of Wight mixed tomatoes, red onion & roasted garlic, marinated in extra virgin olive oil, on toasted bread, with super green pesto, fresh basil & riserva cheese. Now, I don’t have tomatoes imported from the Isle of Wight, nor did I spring for riserva cheese. But I do have Costco. And my friends, this is a Costco kind of recipe, which you know I love to shop at to save money. Everything except for the fresh basil can be purchased in one stop at Costco. I suppose other stores would work, too, but I’m partial to their ciabatta/torta rolls and their walnut/peanut-safe pesto. Plus, they have a bulk pack of beautiful mixed tomatoes this summer that is begging you to make it into bruschetta. So bruschetta in Italian means toasted bread with toppings. 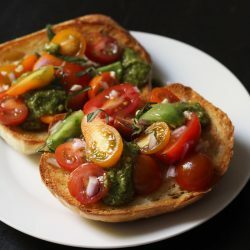 And with this bruschetta recipe, we are using ciabatta rolls and topping it with those beautiful tomatoes, pesto, and a bit of fresh basil. You want to toast the ciabatta first with a garlic oil. I think that makes the best bruschetta to toast the bread first. 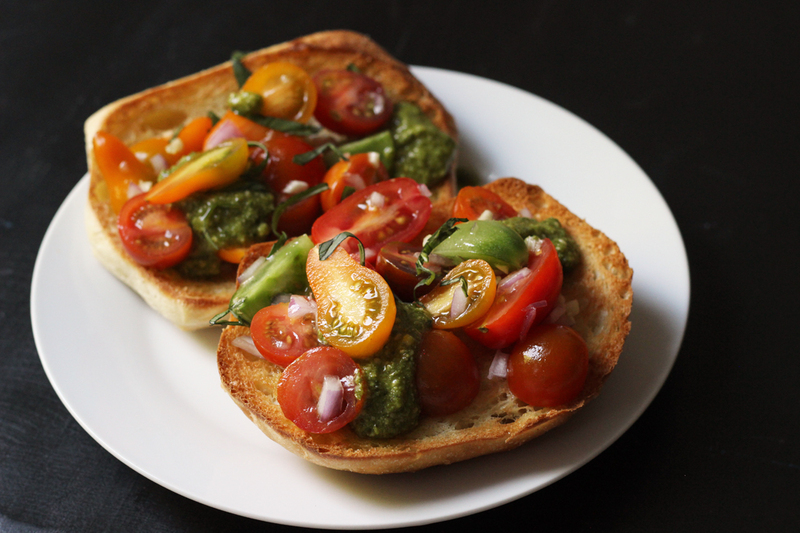 But the bruschetta can be served cold or room temperature and spooned right on top for an easy dinner or light lunch. How Long Will Bruschetta Last In The Refrigerator? You can store the bruschetta (as long as it’s not on the bread) in your fridge for up 3 to 4 days. Just be sure to keep it well covered. Then when ready to eat, you can toast the ciabatta and serve. Stock up on ingredients when they are on sale. Pesto is the big ticket item in this dish. Stock up when you see a good sale. Shop at Costco. When I did my big grocery store showdown, I learned that Costco has the best price for a lot of the things I buy, plus they sell all the ingredients needed for this recipe. stainless steel mixing bowl – I’m not sure you have too many of these. Preheat the oven to 450 degrees. Lay out the ciabatta halves in a single layer on a large baking sheet. In a small bowl combine the olive oil and garlic. Brush the breads with the garlic oil. Toast the bread until golden, about ten minutes. In a mixing bowl, combine the tomatoes, red onion, and remaining garlic oil. Stir gently to combine. 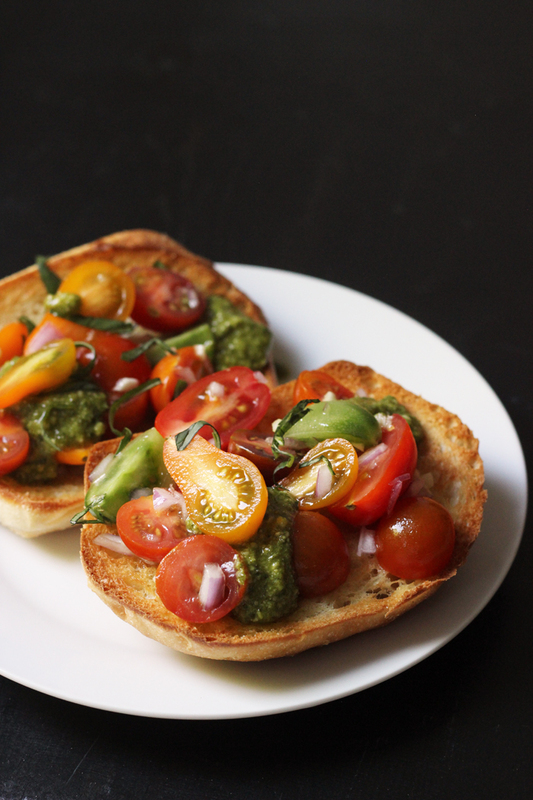 Top the toasted rolls with the tomato mixture and dollops of pesto. Garnish with basil if you like. Serve immediately.